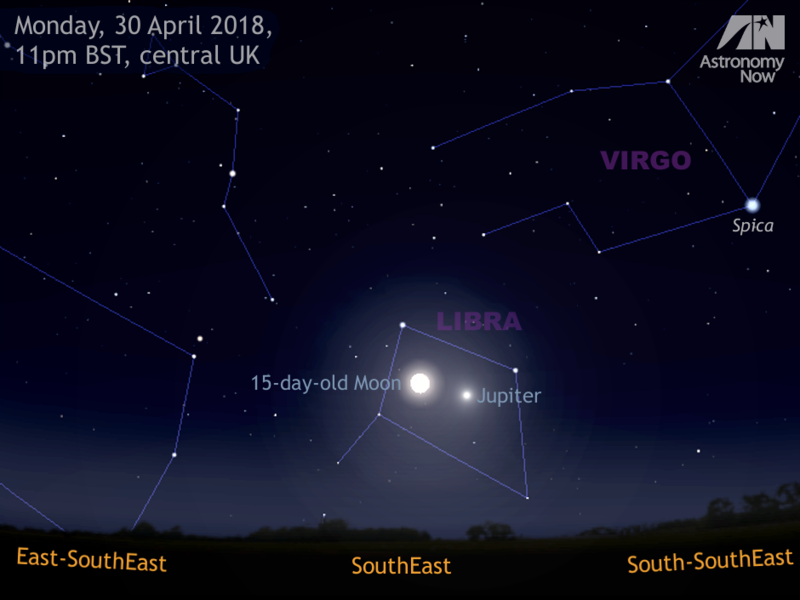 Observers in the UK looking at the rising full Moon low in the southeast around 11pm BST on Monday, 30 April will also see conspicuous planet Jupiter close by. 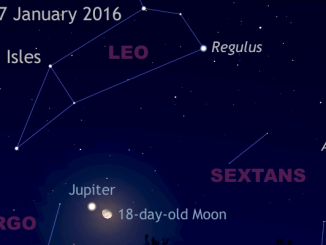 The Moon’s separation from the solar system’s largest planet is just 3½ degrees at this time, the pair fitting comfortably within the field of view of typical binoculars. AN graphic by Ade Ashford. Observers in Western Europe watching the full Moon rise in the southeast late into the evening of Monday, 30 April cannot fail to notice the conspicuous ‘star’ a short distance to its right. This is Jupiter, the solar system’s largest planet, which is rapidly approaching opposition and its closest approach to our planet for the year. Jupiter is nearest to Earth at 11:55 UT on 10 May 2018 when the separation of our two worlds is almost 4.4 astronomical units, or 658 million kilometres (409 million miles). Jupiter is around 660 million kilometres distant on the UK evening of 30 April, but the planet’s mighty 140,000-kilometre-wide globe — almost 11 times the diameter of Earth — requires a telescope magnifying just 41× to enlarge it to the same size as the adjacent Moon appears to the unaided eye. A simulation of a high-power erect-image telescope view of Jupiter and its four Galilean moons Io, Europa, Ganymede and Callisto at 22:00 UT (11pm BST) on 30 April 2018. Observers with Newtonian/Dobsonian telescopes should rotate the image through 180° to match their eyepiece view, while users of refractors and catadioptrics (Schmidt- and Maksutov-Cassegrains) with a star diagonal need to mirror this graphic left-right to replicate their ocular orientation. AN graphic by Ade Ashford. 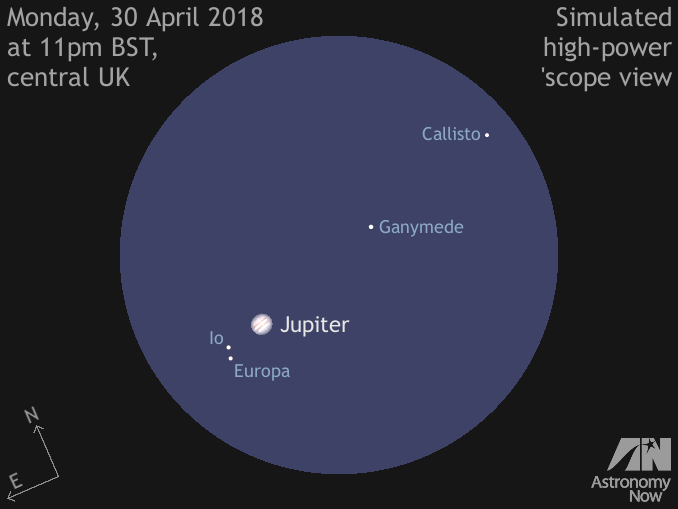 The planet’s rapid rotation will have carried the Great Red Spot out of view by the time observers in the British Isles get a chance to observe Jupiter on the last night of April, but the four large Galilean moons Io, Europa, Ganymede and Callisto will be on show. Their configuration changes rapidly from night to night due to the moons’ orbital motion, but the graphic above will help you identify which is which on the night in question. Predictions of Jovian phenomena for a given date, time and location are always available through our interactive online Almanac. 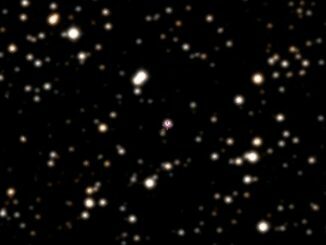 A four-planet system orbiting the star Kepler-223 in the constellation Cygnus is actually a rarity: Its planets, all miniature Neptunes nestled close to the star, are orbiting in a unique resonance that has been locked in for billions of years. For every three orbits of the outermost planet, the second orbits four times, the third six times and the innermost eight times. 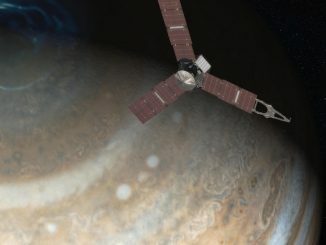 Concerns about the health of the Juno spacecraft’s main engine have compelled NASA managers to keep the research probe in its current arcing, high-altitude orbit around Jupiter, a decision that will delay the full science return from the $1.1 billion mission but should still allow it to meet all predetermined objectives.